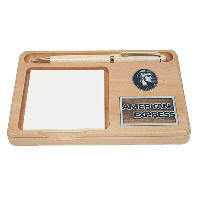 A personalized business card holder, engraved CD case, a personalized memo holder, or pen-and-pencil holder will let your customers know who you are. Contemporary and stylish, these versatile and useful desk accessories will proudly display your name, title, or company logo. Everyone from Executives to Sales People will love the selections. Selections come in maple, rosewood, birch, or walnut. Whatever your style, we can fit your choice. 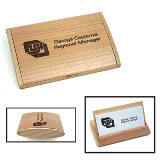 Wood Engraved business card holders are attractive and functional. Whether you prefer a personalized desk stand or prefer to fold it up and take with you, your business cards will be ready to hand out at all times! 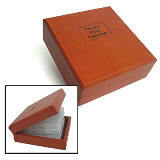 SEE MORE BUSINESS CARD HOLDERS. Rosewood stained piano finish base with name plate. Rosewood piano finish with brass accented base, double pen set with desk clock. Golf clock and pen set on rosewood piano-finish base, club shaft is a pen. Dress your desk with distinction! 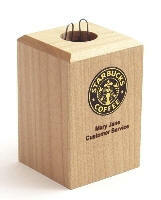 These high quality wooden pen stands come in a variety of styles. Personalized and engraved with your name, business name, or logo, they make your office complete with their presentation. 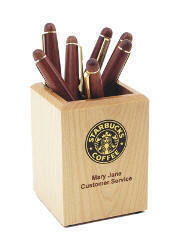 SEE ENGRAVED WOODEN PENS, PENCILS, GIFT SETS and MORE PEN STANDS. Click here. 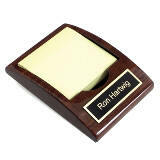 Rosewood piano finish nameplate with pen, business card holder, and gold tone metal golf ball / clock. Engraving and Personalization included in all prices item!